Samothraki's north coast from the sea near Kamariotissa. The 1611 metre high Mount Fengari dominates. The 1611 metre high Mount Fengari (Φεγγάρι, Moon Mountain) dominates the island of Samothraki and spreads itself wide to occupy most of its area. According to Homer, the sea god Poseidon sat on top of this mountain in order to get a good view of the Trojan War. The main port of Kamariotissa (Καμαριώτισσα) lies low on the northwestern tip of a wide plain on the west of the island, and thinner coastal strips along the north and east allow roads to connect it with the other small villages. On the south side the mountain plummets into the sea, leaving a little room at its foot for a few isolated homes. Chora (Χώρα, literally "village"), the capital, perches high on a steep hill around 8 km inland, east of the port, beneath the steep sides of one of the mountain's lower flanks. The island sits near the western end of the Dardanelles, the sea channel which leads from the Thracian Sea in the North Aegean, through to the Sea of Marmara and on to the Bosphorus Strait at Istanbul and the Black Sea. This has been an important route for traders, colonizers, armies and pirates since prehistory. However, because of the island's terrain and the fact that it has no natural harbour against the often rough winds on the Thracian Main, it never became a large strategic military base like many of its neighbours. Its isolation in modern times has meant that it has remained relatively unspoiled by "progress", and it has much to offer nature lovers and hikers in the way of beautiful wooded paths, small rivers, waterfalls, uncrowded beaches and marvellous views over the Aegean. To people in ancient times, this remoteness and the huge brooding mountain rising dramatically from the sea made it seem mysterious, perhaps even forbidding, and the perfect place for the home of the enigmatic Cabeiri (Κάβειροι, Kabeiroi), otherwise known as "the Great Gods". The worship of these archaic deities at the Pan-Hellenic Sanctuary of the Great Gods survived the predominance of the Olympian gods into Classical, Hellenistic and Roman times. Their secretive cult even grew in poularity, partly due to its democratic character - it permitted initiates from all classes, including slaves - but also drew the wealthy and rulers, including King Philip of Macedon and his wife Olympia (the parents of Alexander the Great who first met here) and Roman emperors. The fascinating archaeological site of the Sanctuary of the Great Gods and the adjoining small museum, at Paleopolis on the north coast 6 km east of Kamariotissa, are the island's most popular attractions for tourists, the majority of whom are Greek. The small island has a very limited choice of accommodation and restaurants, and in summer they tend to get booked out very quickly. location: Geographically, Samothraki is one of the northernmost islands of the Northern Aegean islands, in the Thracian Sea, which is part of the northeastern Aegean Sea. It is around 43 km southwest of Alexandroupoli, on the Thracian coast in northeastern Greece. periphery: (administrative region) East Macedonia and Thrace, which is part of the larger semi-autonomous Macedonia Region. capital: Chora (Χώρα, literally means "village"), also known simply as Samothraki. The hilltop village, around 8 km of Kamariotissa port, is the island's second largest settlement (population 653). 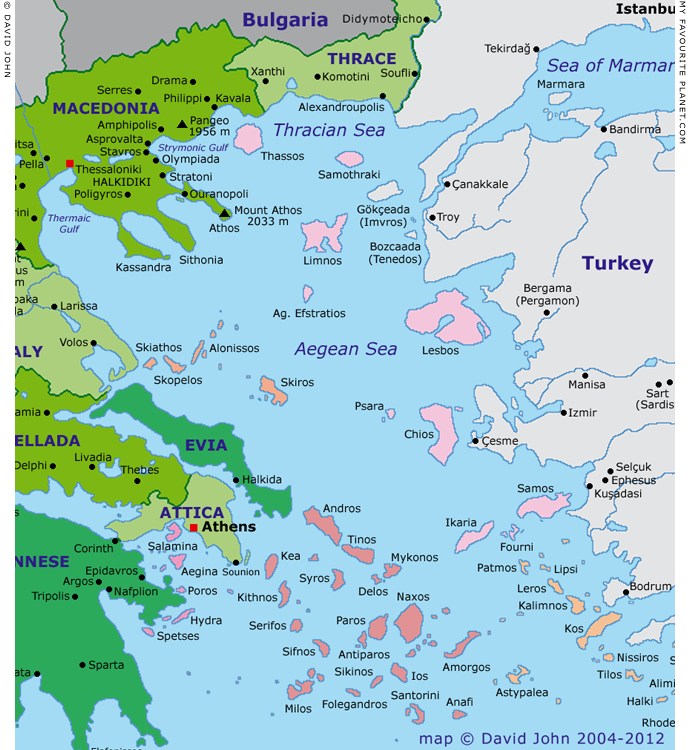 communities: The largest settlement and main port Kamariotissa (Καμαριώτισσα, population 1,069) is at the northwest tip of the island. and 12 km north to south. 1611 metres above sea level. The mountain takes up most of the area of the island. Much more interesting (and useful) is Ralf Scheel's website dedicated to the island www.samothraki.com (in Greek, German, English, Bulgarian and Romanian). 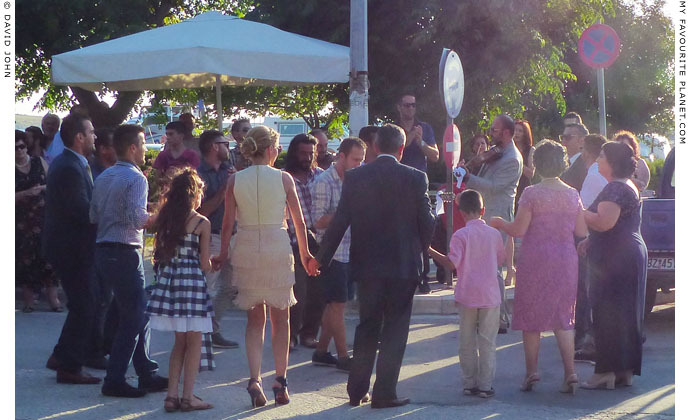 A circle dance at Kamariotissa harbour before a fireman's wedding. 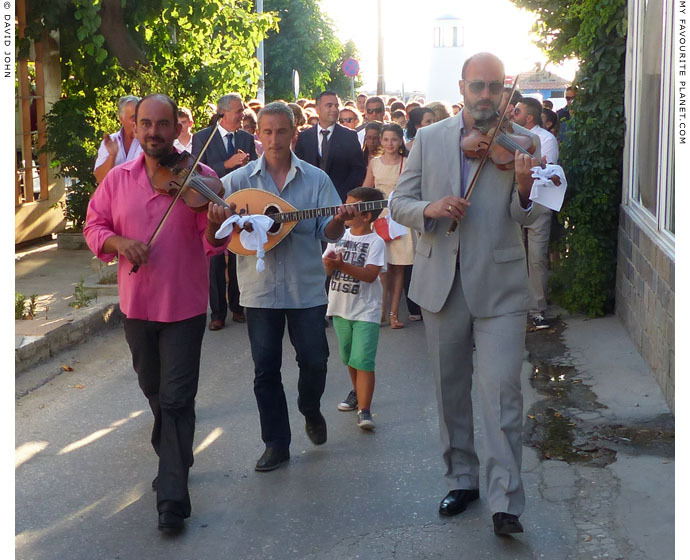 Musicians lead the wedding procession from Kamariotissa harbour along the narrow street to the church. 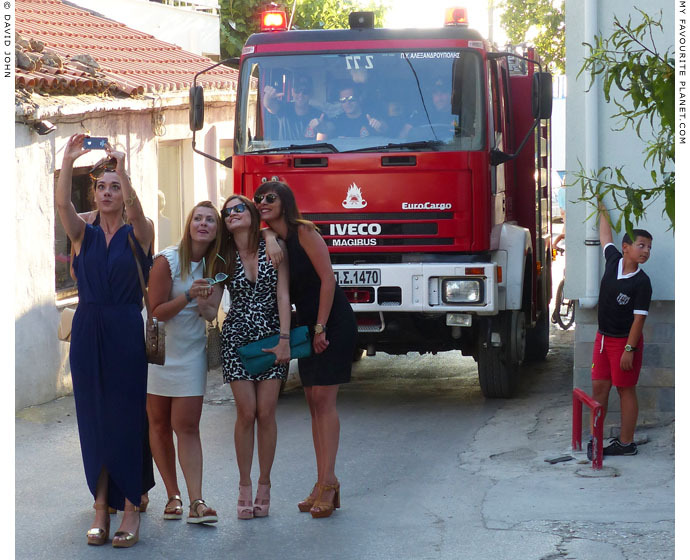 The local fire engine and selfie brigade bring up the rear of the wedding procession. Maps, photos and articles: © David John 2004 - 2015. Images and materials by other authors have been attributed where applicable.